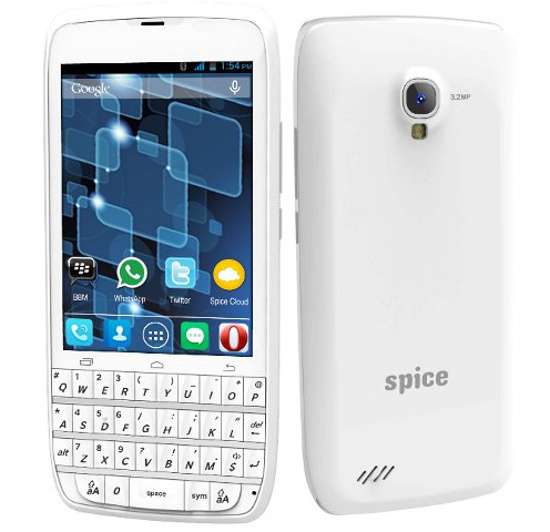 Spice Stellar 360 with QWERTY Keyboard has been launched at price of RS 4799. S Mobility has already launched a smartphone with Qwerty keyboard back in 2013. The new Stellar Mi-360 has 3.5 inch display having 480 x320 pixels HVGA resolution. It comes with entry level specifications and features. To please the user company has pre-loaded the phone with Opera Mini, BBM, Twitter, Whatsapp, OXL, Spice Cloud storage and Get-it applications. The Stellar 360 draws the power from 1.3GHz dual core CPU coupled with mali 400MP GPU. It is a dual SIM handset and runs on Android 4.2 OS. It is accomplished with 3.2MP rear camera with LED flash and a 1.3MP front facing camera. The handset should be good who want a android phone , but want a real tactile keyboard instead of virtual on screen buttons. It houses a 1500 mAh battery, which should offers good backup and talktime. The Stellar Mi360ia available in White and Silver colors. You can Buy It from Amazon India, it also comes with a free pouch.